We are in a process of feeling: Anger, resentment, sadness, grief so on – a range of emotions = from a bulk of ‘old’ doors all open at once. Of usually a main theme that has woven through our lives, with so many other attachments in life experiences with this. This is quite relentless energetically right now….as this is still continuing as there are so many energies shifting and changing. We are feeling this not only in the ‘above’ – yet also with the ‘below’. As we are finding ourselves being ‘pulled’ back-and-forth by the energy of Gaia and the Astrals/Multi-dimensions alternatively or at the same time. So many are having ‘real dreams’ and are dealing with SO MUCH in the Spirit realm, as well as experiencing all they have/are in the Human Real World. We are doing DOUBLE (shifts ;-). This is going on with our Spirit and our Soul! As we may have done all we could have here in the human with other souls, yet we are needing to ‘finish things up’ in the astrals, hence the ‘real dreams‘. Back and forth, push-pull. It has been quite the ‘challenge’ to continue on in all else while feeling these energies! As things feel very much ‘all over the place’ – because the energies are. Having some insight and understanding that this is to do with stepping into our Divine Mastership and balancing our Divine Feminine and Masculine AND our Soul and our Spirit, helps us to accept and embrace this for what it is. As these energies are a lead up to the Next Full Moon on the March 12th and then the upcoming Equinox on the 20th March as well. The lead up of the last week was being in a whole ‘other space’ which was new and different…this has then continued to feeling ‘up and down’ and then add in ‘around and around’ energetically. Imagine a door (to our left) and looking into that space, and seeing many other (open) doors within this, this is what I am being shown for us from Spirit. In allowing ourselves to see this to our left (of the old/the past) – expands our energy to seeing more of the bigger picture for ourselves. Keep that vision going on in all you are doing, this helps/allows an assimilation and integration of the bigger picture in Spirit to the human. As you reflect on the emotions you are feeling, and see them as part of the bulk of old doors open at once, then in their own time energetically those doors of the old, will close (there is much to this for each of us). As one reaches a new ‘blank’ and clear ‘space’ after going through this (a new void)…and then we continue to experience more energies to do with more door’s closing and then newer doors are in the processing of forming for very new experiences (to then shift through this void energy). It depends on each of us as to what we are needing to feel and experience with each old door that is open, as to when we are then able to energetically start to close the old doors within a single one, larger door. Please know that in all of this, ultimately this is about stepping into our New MASTERSHIP and a New COMING HOME. 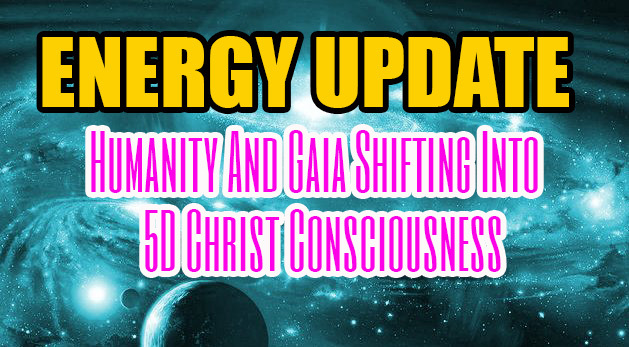 PART 5 – HUMANITY/GAIA SHIFTING INTO 5D Christ Consciousness as a WHOLE! We are feeling up with our Spirit, down in the Human, to the left of the old doors and the right of the new future = The Cross = The Christ Consciousness energy in the Human and the Spirit BOTH – (with the March 20th Equinox energies that are coming in). Where 3D and 5D are separating! Where Gaia will be in the Christ Consciousness energy as well – a return to Christ energy as a whole! (This is different for those that have shifted into this energy already for themselves). This is in the Human and Spirit. As we have shifted spiritually (above) energetically into 5D and now this is the ‘other’ balance of Gaia (below) – now shifting vibrationally as well! A pure Christ Consciousness link of 5D energy in Spirit and Gaia! So not only are we feeling our up and down, side to side energies, we are also feeling this for all of HUmanity as well! What this means I will share in future Real-Time updates. As there are other articles about this, which is fantastic information that is being shared for us all to resonate to/for within ourselves. Yet to experience this ‘insight/information’ in the human and linking this to our Spirit – is a whole other ‘thing’. So while this is what I am perceiving and receiving, I like to ‘wait and see’ as in, feel and experience what this is for us in Reality and being very real in the Human, linked with our Spirituality. Because, if this is the case, in that we are shifting as a ‘whole’ into Christ Consciousness 5D – this is big, beyond big. So we will just ‘wait and see’ with this ;-). PART 6: CROSSING THE VOID WITH GAIA INTO THE CHRIST CONSCIOUSNESS – 5D (With the March Equinox energies). Many are feeling the ‘void’ that is needing to be ‘crossed (through) and over’ as being part of Humanity in linking Gaia/Mother Earth, with Spirit into 5D in totality! What we have been experiencing in the last say week (intensely) and more for others, is needing to make choices. To make a SOUL CONSCIOUS choice of where we are at with coming from our ‘heads’ and negative ego. Of linking our Soul to our Spirit – through our emotions. This is where we take a ‘final’ leap through and over the void or deep ‘chasm’ (of the past) in faith and trust. Now, these are ‘just words’ to some, yet they are so much more than this. This is such a finality of Gaia finally shifting into 5D Christ Consciousness with Spirit (linked to the balancing with the Divine Feminine and Divine Masculine energies). This has been a complete healing of a Time-Line that has been involved with this. This has been old doors closing with new opening. As we step into our Divine Mastership – Of a New Coming Home. There is so much in this to/for many people, as many are dealing with past relationships of many kinds. Many are dealing with past abuse of all forms. (Past Blue Beyond posts have been a time-line of our Ascension in Spirit and the Human. And a new post on this will be shared shortly as this is more than our Higher Selves, there is another ‘element’ to our connection with Spirit). I personally ‘know’ and have experienced what it is to go through the ‘void’ (or Abyss) back to Source/Spirit as I did this/needed to do this a few years ago over 3-4 days, as part of being here to ‘penetrate the dark forces’ as told by Spirit – as a Pioneer/Trailblazer/WaySeer for and with Humanity. Which I shared briefly about in a recent BB post. (As many are going through their void or their Abyss, which is unique to them). As part of ‘stepping into my Divine Master(ship) energy of 5D. Of paving the way for and with humanity in linking our Spirit to our Emotions. In now being in Christ Consciousness energy of 6D in the Human and 8D in Spirit. This has and is allowing me to experience all I am in 6D energy with humanity, otherwise I would not be able to bring forth and through these unique energy updates if I was still in 5D in the Human. I am sharing this, not for my ‘benefit’ – as there is no negative ego when one comes from Christ Consciousness, but for YOU the reader/humanity. So you ‘know’ that the way has been paved already (energetically) and ‘done’ by another human being here and now as an Ascended Earth Master. As we are writing the new History books, so-to-speak, as we are experiencing this – all we are in Real-Time – now. And not just ‘writings’ of what this is in the Spiritual aspect, we are now combining the Spirit with the Human in a New Way like Never Before. We, you and I – We Are The Change! Just by being you and all you are and all you are personally experiencing – is enough. I honor each and every one of you beautiful and amazing souls, as so many of you ‘share your stories’ of your lives with me – I thank you for all you are and also being here at this time. As really, We Are One – of the Divine. And we Are Coming Home in a way, like never before. I honor so you deeply in my Soul – and from my Spirit too.